The current situation in Syria remains one of the most important components of the Middle Eastern and international policies. Using Syria’s domestic crisis and pursuing their own goals NATO, Israel, Turkey and the monarchies of the Persian Gulf are trying to undermine the Syrian regime. Since the beginning of the crisis in Syria I have made two trips to that country as a member of international delegations in August 2011 and in January 2012. If we watch the dynamics of situation’s development over that period on the one hand we can state intensification of terrorist groups in Syria and on the other hand we see a broader people’s support of President Bashar Assad and a clear demarcation of political forces’ positions. Two car bombers blew themselves up outside the heavily guarded compounds of Syria’s intelligence agencies, killing at least 44 people and wounding dozens more in a brazen attack in December 23, 2011. In the last two months Syria has seen a number of terrorist attacks. The terrorist attacked Syrian servicemen and military facilities, law enforcement agencies institutions, blasts on oil pipelines, railroads, murders and taking of hostage among peaceful citizens (In the city of Homs insurgents killed five well known scientists), arson of schools and killing of teachers (since March 2011, 900 schools have been set on fire and 30 teachers have been killed). 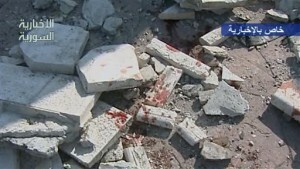 Terrorist attacks in Damascus became one of the bloodiest. Two of them were carried out on December 23, 2011 when cars loaded with explosives went off in front of the buildings of state security service killing 44 and injured about 150 people. On January 6, 2012 on a busy street a suicide bomber attack killed 26 and wounded 60. There were officers of the law enforcement agencies among the victims but most of the victims were occasional by-passers. 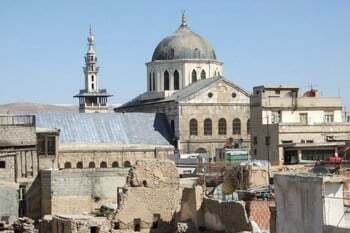 In January 2012, Damascus has a more severe look in comparison with summer of 2011. Security officers check passports on the way to the airport, asking people what country they are from. Entrances of many state institutions are protected with concrete blocks. There are check points with sand bags near the police stations which are protected by soldiers in bullet proof vests. Lifting gates which close entrances to some of the streets are also by guarded by soldiers and young people with machine guns – these are volunteers from pro-governmental youth movements. But everyday life has not drastically changed. There are no servicemen, armed vehicles or document checks in the city. Damascus is still a busy city, with no vacant seats in internet cafes and on weekends streets are crowded with family couples and young people. After terrorist attacks in Damascus demonstrations with slogans supporting Bashar Assad and condemning terrorists were held everyday. Similar demonstrations were organized in other large cities such as Aleppo, Homs, Hama, Daraa, Deir az Zor. These demonstrations were covered by the Syrian TV. During our stay in Syria we could move around the city freely and speak with people as we liked but we did not see any single anti-governmental rally. Most of the rallies’ participants were young people. 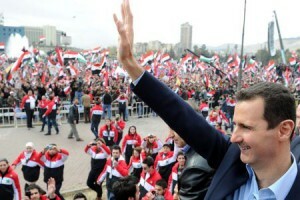 Syrian President Bashar al-Assad waves at supporters during a public appearance in Damascus on January 11, 2012 in which he vowed to defeat a “conspiracy” against Syria. The most massive rally which gathered tens thousands of people was held on January 1 in the center of Damascus. At that rally Bashar Assad addressed to the nation starting his speech with the words: “Brothers and sisters!” He was speaking about a thousands year long history, the need to fight terrorism and the support terrorists receive from abroad. Assad’s speech was received with real enthusiasm and there were no signs that this reaction had been staged. The whole square (tens thousands of people) shouted a popular slogan “Allah, Syria, Bashar!” (“Allah, Syria va Bashar bas!”). On January 8, in the memory of victims of terrorist attacks in Damascus a commemoration ceremony was held in St. Cross Cathedral in Damascus. The Mufti of Syria Ahmad Badr Al-Din Hassoun, the metropolitan of the Syrian Orthodox Church and the prior of the Catholic monastery spoke at the ceremony. In their speeches they condemned “the killers and those who put weapons in their hands and sent them to Syria”. The tragedy of the mufti of Syria, whose son was killed by the members of the Islamist terrorist group after the mufti had refused to act on the side of the foreign opposition, which goal was to overthrow Bashar Assad, is a telling example in itself. After the adoption of a new law on political parties an active process of their creation has been underway in Syria. Although formally the constitution envisaged a multiparty system and seven parties were represented in the parliament, in compliance with clause 8 the leading role belonged to the ruling Baath party. Currently there is a wide discussion in Syria about this clause. An official with the Syrian Foreign Ministry told us that in the new constitution (on which the national referendum would be held in February), this clause would be abolished if most of the public and political forces spoke for it. In his address to the nation Bashar Assad said that the new constitution would be approved in March 2012. The parliamentary elections are to be held in May-June 2012. Along with the law on political parties new laws on general elections, local administration and mass media were adopted. In compliance with the new law in December 2011 elections to the local governments were held. But because of the threat of terrorist attacks the turnout was only 42%, which was confirmed by the Baath officials. Nevertheless, the local administrations were elected and began to work. Under the recently adopted law new mass media are being formed in addition to the current 20 TV channels, 15 radio stations and 30 newspapers. At present there are three main trends in the Syrian patriotic opposition – democratic, liberal and left, which is mainly a communist one. The Syrian Social Nationalist Party is the most influential party among the democratic forces. It is also the oldest party which was established in 1932. As Iliah Saman, a member of the political bureau of the Syrian Social Nationalist Party said, the party’s program is more conservative in comparison with the Baath’s program. Nevertheless there are no differences of principle between the two parties. According to him, the policy of the US, France and England is the main destabilizing factor in Syria. He said that those countries were acting in the interests of Israel and had the goal to divide Syria into five state formations on the basis of religious and ethnical differences. The liberal trend of the opposition is represented by the recently registered secular democratic social movement led by Nabil Feysal, one of the Syrian intellectuals, a writer and a translator. He is an outright opponent of the Islamic fundamentalism, supporter of the liberal democracy. His goal is to turn Syria into “Middle Eastern Denmark”. The National Committee for the Unity of Syrian Communists is the most influential component of the left (communist) trend of the opposition within the country. Recently it has changed its name for the Popular Will Party which is headed by Qadri Jamil, a prominent Syrian economist and the professor at the Damascus University. He is the only representative of the opposition who entered the committee on the design of the new constitution. Jamil believes that the national dialogue and creation of the government of the national unity (which would include representatives of the patriotic opposition) is the only way out of the crisis. At the same time he thinks that it is necessary to remove all the politicians who are not interested in conduction of reforms from the government, to clean up the opposition from destructive factors and to suppress its radical members who tend to use violence. The coordination committees are also significant political force which has contacts with the Popular Will Party. These committees on the one hand organize demonstrations demanding concrete reforms and better living conditions on the other hand act as self-defense units which armed people protect their districts from attacks of terrorist groups in particular from a so called Liberal Syrian Army. It should be noted that although in the beginning of protests in Syria, part of the population, including intellectuals shared the opposition discontent with the regime and supported demands on democratization now, after intensification of terrorist groups, they tend to support the regime and the reforms proposed by the government. A telling example of terrorist crimes was the shelling of a quarter in Homs on January 11 which killed eight local residents. Giles Jacquier, a reporter with France-2 TV, became one more victim of the attack. We spoke with Jacquier shortly before his tragic death and he was convinced that people’s protests were suppressed by the authoritarian regime in Syria. He was looking for the opposition everywhere trying to make a report. On failing to find it in Damascus he moved with a group of Dutch and Swiss colleagues to Homs. But in Homs he also met people who were supporting Bashar Assad and demanding to protect them from terrorists. A group of local residents and Giles Jacquier who happened to be near came under a grenade thrower fire, which was a common thing in that district. Commenting the tragic death of the French reporter Mother Agnes Mariam, who is the prior of the St James Catholic Cathedral in Damascus, said that there is no protesting opposition in Syria but only bandits who are killing people. Many people we contacted in Syria including independent foreign reporters told us about the information war against Syria. According to them, Qatari channel Al Jazeera, for example, in order to broadcast a report on mass anti-governmental rallies in Syria made a fake footage with the help of computer editing using dozens of atmosphere players and decoration of Syrian streets, a kind of “Hollywood village”. As for the Syrian opposition abroad, its political part is represented by the Syrian National council with the headquarters in Istanbul. It is headed by Burhan Ghalioun, a Syrian-French political scientist at the Sorbonne University in Paris. It is quite a heterogeneous formation which comprises groups with different goals. They represent the Muslim Brotherhood and other Sunnite organizations, Kurdish separatists, Liberal-Democratic dissidents who usually reside in Europe and in the US. The armed opposition which conducted terrorist attacks in Syria is represented by a number of groups from a military wing of the Muslim Brotherhood to the Libyan radical Islamists and Al Qaeda. According to the information we receive from our Syrian colleagues there are training camps for insurgents in Lebanon and Turkey. The officers of security services of NATO, Turkey and some Arab states are in charge for the training and armament of the insurgents, while the monarchies of the Persian Gulf provide the financing. The future development of the situation in Syria depends in many ways on the ability of the ruling regime to consolidate public forces and conduct the announced reforms. Other priorities are the liquidation of terrorist groups and stabilization of the domestic situation. In its turn this issue is directly linked to the development of the global policies and will depend on the activities of the leading countries of NATO, Turkey, the Arab League (which sent its monitors to Syria) Russia and China. As for Russia, it firmly declares that repetition of the “Libyan scenario” in Syria is inadmissible. 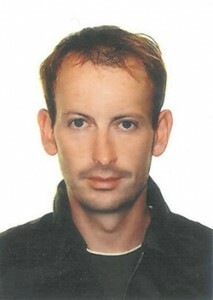 Boris Dolgov is Ph.D. (History), Senior research fellow of the Centre for Arabic Studies of the Russian Institute of Oriental Studies.